Some in the party are trying to weaken the power of superdelegates to determine the party's nominee in 2020. CHICAGO — The Democratic National Committee is set to vote this weekend on a Bernie Sanders-backed plan to weaken the influence of superdelegates in what has become a contentious showdown between factions at a time when the party is trying to project unity. After two years of work on the controversial issue, a delicate compromise that emerged from a labyrinthine reform process has encountered last-minute opposition before the crucial vote here Saturday at the party organization's summer gathering. "We're fighting it, we're picking up support, we're creating a lot of doubt," said Bob Mulholland, a DNC member from California who opposes the change. 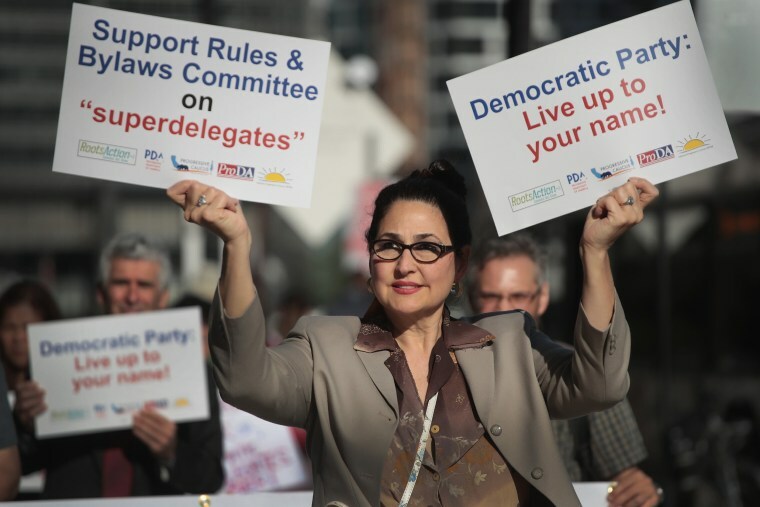 The proposed change would not abolish superdelegates, but would potentially greatly diminish their influence by preventing them from voting for the presidential nominee at the party's convention — unless the convention deadlocks, which hasn't happened since 1952, or the outcome of the vote is already a done deal. Tensions were running high as DNC members, nearly all of whom are superdelegates, gathered at a hotel in downtown Chicago to set the rules for the 2020 Democratic presidential contest. Officials are bracing for a potentially noisy floor fight Saturday, which could undermine the sense of unity the party has been hoping to project as it heads into the November midterms. The fight over superdelegates — the DNC members, congressmen, governors and other party leaders who can vote for whomever they want to nominate in a presidential primary — has scrambled the establishment-progressive internal split, with DNC Chairman Tom Perez aggressively pushing a reform package to weaken superdelegates that has been endorsed by Sen. Bernie Sanders, I-Vt.
"It is really kind of bizarre to actually be on the same side as Perez on this one," said Selina Vickers, a activist from West Virginia who is on the sixth day of a hunger strike in support of the change. "They're doing this very strategically because they want to win," Vickers added of Hillary Clinton-wing DNC members who support the change. "When people feel like their vote doesn't count, they're not going to turn out to vote." Superdelegates overwhelmingly sided with Clinton over Sanders during their 2016 primary, with Vickers noting that Clinton won more delegates from her state of West Virginia even though Sanders won every single county in the primary. Clinton secured more delegates because every superdelegate from the state backed her. The system, which was created in the 1980s as a failsafe to prevent the party from nominating a critically flawed candidate, has been controversial for years. Critics say it gives too much power to a small group party insiders who could theoretically overturn the will of voters, as expressed in state primaries and caucuses, although that has never happened. Not surprisingly, many superdelegates are not thrilled about losing their influence. Rep. Cedric Richmond, D-La., the chairman of the Congressional Black Caucus and a rising star in the House, sent a letter to Perez this month expressing opposition to the change. "One group should not be harmed at the expense of the other," he wrote. "To add insult to injury, it appears that this is a solution in search of a problem. Unelected delegates have never gone against the will of primary voters in picking Democratic presidential nominees." But opponents of the change acknowledge they are likely outnumbered, even as they scramble to scrap together enough votes to block the measure Saturday. "I'm opposed to it, I'll be arguing against it, but the numbers don't look good," Mulholland said. "This is a group that has succumbed to Bernie Sanders and it's embarrassing." For Perez, who has faced rear-guard opposition since his contentious election to chairman early last year, the reform could be a legacy-maker. "I know this is personal, this is emotional, this is incredibly important," Perez told dissident DNC members Thursday. "And what I would simply say to you is don't underestimate the source of your power. The source of your power has been a lifetime of work and service that makes you in-demand." "As a so-called 'superdelegate' myself," Howard Dean, a former party chair who supports the change, said in an email to DNC members, "we need to unify around our shared values, inspire trust in voters, and energize the grassroots. And one of the best ways we can do that is by reassuring our voters that this is their party. This is the party of the people."